The TEG-5-10-15 DC pump can be used for most circulation pump applications without connection to the power grid. Highly efficient, the TEG5-10-15 can be connected directly to a TEG Generator and is characterized by its small size, high efficiency, and extreme low power consumption. The long life brushless motor technology provides maintenance free and quiet service life. 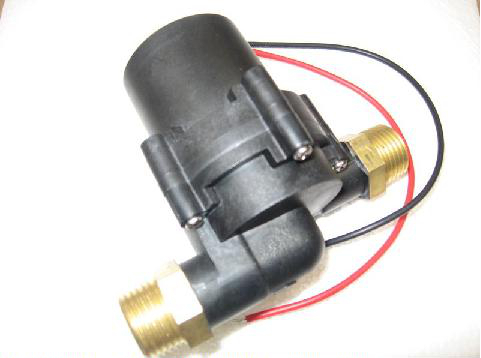 This pump is perfect for single family home thermal HYDRONIC systems or any circulation pump application where conventional power is not available. TEG operated the TEG5-10-15 pump can be powered directly from a TEG Generator. The pump slowly starts with the smallest amount of current and pushes the heated water to the storage tank. It’s all too simple and eliminates all controllers, thermostats and sensors. Generator provides sufficient power, the pump goes through the alignment phase by turning the rotor into the position required for start-up. The processor then waits until the capacitor is sufficiently charged. This enables a start-up with minimal power (less than two watt). Cycling due to unsuccessful attempts is minimized. Even after prolonged shutdown, the pump will start reliably. media), the pump will eventually shut down completely. After cooling down, the pump will restart automatically. Ryton (PPS): one of best engineering plastics, can stead of metal material in many field, with a high mechanical strength, high temperature, chemical properties of advantages such as; have a thermal stability, excellent heat resistance, high mechanical strength, its continuous use temperatures up to220-240℃, at 1.82 MPa load heat distortion temperature of above 260℃.